People are living longer, and organizations are shifting their attitudes toward older workers as a result. Organizations that can turn advancing worker age into an asset could gain a competitive advantage. Rising life expectancies and an aging global workforce present organizations with unprecedented challenges and untapped opportunities. Companies that plan, design, and experiment with workforce strategies, workplace policies, and management approaches for longer working lives can reap a longevity dividend. Those that lag behind face potential liability concerns and skill gaps. Creating ways for people to have meaningful, productive multi-stage and multidimensional careers is a major opportunity to engage workers across generations. These demographic facts have profound implications for individuals, organizations, and society. In this era of longevity, an individual’s career can last far longer, spanning generations of technologies and businesses. Companies can employ people into their 60s, 70s, and beyond as the pool of traditional “working-age” (20- to 54-year-old) adults shrinks. For their part, many individuals find the need—financially and/or emotionally—to stay in the workforce past “traditional” retirement age. In our 2018 Global Human Capital Trends survey, 29 percent of the respondents rated longevity as a very important issue, and another 40 percent rated it as important. Respondents in Japan in particular, whose population is rapidly aging, were especially concerned about the issue, with 41 percent saying that it is very important. As talent markets grow more competitive, organizations often find it valuable to keep older workers on the job rather than replace them with younger ones. Our research shows that older workers represent a largely untapped opportunity: Only 18 percent of this year’s respondents said that age is viewed as an advantage in their organization. But leading companies are beginning to focus on this talent pool as a competitive advantage. Proactive organizations are tapping into the older talent pool by extending their career models, creating new development paths, and inventing roles to accommodate workers in their 50s, 60s, and 70s. This year, 16 percent of the respondents we surveyed for this report say their companies are creating special roles for older workers, and 20 percent are partnering with older workers to develop new career models. Organizations could find great value in older workers’ ability to serve as mentors, coaches, or experts. Taking on these kinds of roles allows older workers to “pass the baton” to younger generations, while making room for ambitious younger workers. 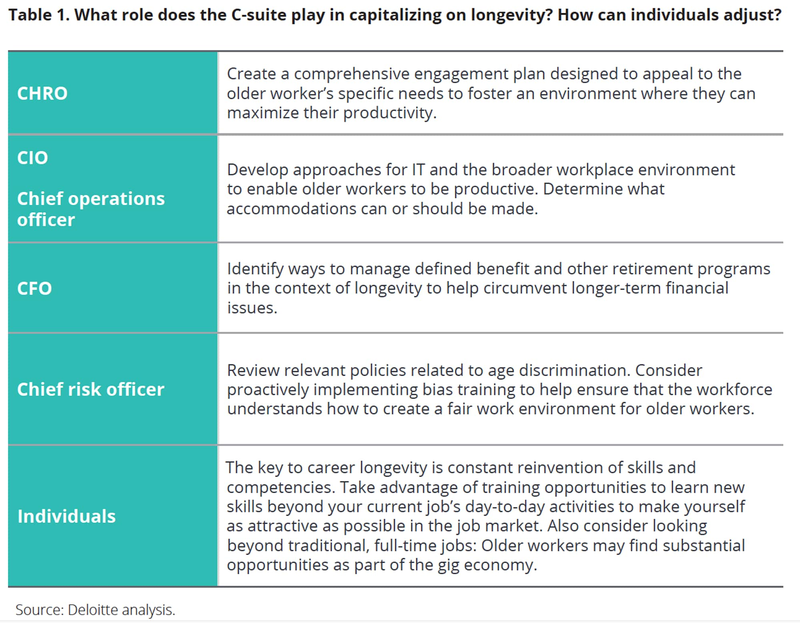 Reskilling also plays a role in successful strategies to utilize older talent. One global telecommunications provider encourages senior workers to reinvent themselves and invests in programs to help them acquire new technical skills.16 Software engineers who have built careers on older technologies such as COBOL or C++ can use this experience to learn mobile computing, AI, and other technologies at a very rapid rate. The transition toward older talent can present challenges. Older workers may have specialized workplace needs and can attract resentment from younger workers, and they often enjoy higher salaries because of their tenure. Organizations looking to assimilate an older worker population may face the need to design new wage policies, create more flexible rewards programs, and train young leaders to manage people across generations (including team members who may be their parents’ age). Pensions are another area where longevity impacts organizations. The World Economic Forum estimates that a $70 trillion global retirement savings gap exists today, highlighting the sharp difference between retirement needs and actual retirement income. Moreover, this gap is projected to grow to $400 trillion by 2050.18 Helping older adults to work longer and manage their retirement savings will be a vital need for companies in order to avoid the negative productivity effects of financial stress. Our Global Human Capital Trends research shows that many organizations are unprepared to deal with the aging of global workforces. Nearly half of the respondents we surveyed (49 percent) reported that their organizations have done nothing to help older workers find new careers as they age. 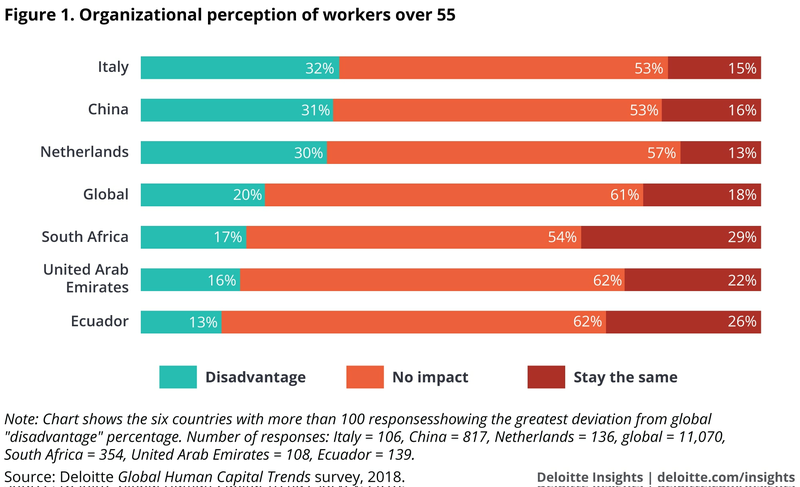 Rather than seeing opportunity, 20 percent of respondents view older workers as a competitive disadvantage, and in countries such as Singapore, the Netherlands, and Russia, this percentage is far higher. In fact, 15 percent of respondents believed that older employees are “an impediment to rising talent” by getting in the way of up-and-coming younger workers. Are older workers an advantage or a disadvantage? Perceptions of workers over 55 years old spanned both extremes, though these perceptions varied significantly by country. Based on these findings and our anecdotal observations, we believe there may be a significant hidden problem of age bias in the workforce today. Left unaddressed, perceptions that a company’s culture and employment practices suffer from age bias could damage its brand and social capital. The demographic math is undeniable: As national populations age, challenges related to engaging and managing the older workforce will intensify. Companies that ignore or resist them may not only incur reputational damage and possible liabilities, but also risk falling behind those organizations that succeed in turning longevity into a competitive advantage. Staying competitive in a world of unprecedented longevity demands that organizations adopt new strategies to engage with older talent. Traditional assumptions—that learning ends in one’s 20s, career progression ends in the 40s, and work ends in the 60s—are no longer accurate or sustainable. Rethinking workforce strategies across multiple generations to account for longer lives will require open minds and fresh approaches.